When Henry Ford introduced the assembly line into auto manufacturing, he changed the nature of the industry forever. What people sometimes don’t consider is that that revolution sparked a subsequent revolution in distribution and logistics. As cars became less expensive and more widely used, they quickly became the preferred method for transporting goods between producers and consumers. In turn, the introduction of automobiles into the distribution of materials changed the nature of auto manufacturing once again. How? By offering new avenues through which to source raw materials, resulting in new efficiencies in the manufacturing process. Why are we telling you all this? To demonstrate the way that manufacturing (particularly auto manufacturing) and logistics can impact one another and drive mutual evolution over time. The early days of auto making were one such instance, and we’re seeing another one emerging right now with the rise of Industry 4.0 and Logistics 4.0. Sure, Industry 4.0 came first and defined many important paradigms for future digitization, but Logistics 4.0 is now applying those paradigms to logistics in a new way. This means that just as the Industry 4.0 revolution has had a significant impact on logistics, the resulting logistics paradigms are now exerting an important influence on manufacturing. Henry Ford would be proud. As most of you reading this are probably aware, Industry 4.0 thrives on connectivity. Early adopters have aggressively pursued the integration of IoT devices and other sensors into production processes in order to create data streams that effectively reflect factory floor operations. Using those data streams, it’s possible to uncover potential process improvements, predict the outcomes of future events or changes, and build towards the “cyber-physical systems” that are becoming increasingly crucial in modern manufacturing. With the advent of Logistics 4.0, there’s the potential for this push towards connectivity to expand outside the factory floor—to freight providers, transport networks, and suppliers. For automotive manufacturers, this represents an exciting opportunity to build even smarter planning workflows. Rather than operating your factory as a self-contained system, you can now adapt your production flows to what’s happening in the rest of the supply chain. Let’s say you're working with a relatively lean supply chain, and you’re trying to avoid storing any particular raw material for too long before it’s used in a production process. 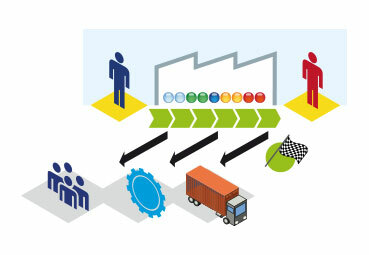 If your inbound logistics systems are operating with a high degree of connectivity—such that they can send data to your production control tower—you can potentially gain a granular view of the timing of incoming shipments, and then adjust your production ratios in order to optimize the use of parts as they come in, leading to reduced inventory costs. By the same token, you might get real-time feedback from your outbound flows indicating that a particular part or model is leaving your inventory more slowly than expected (due to demand fluctuations, for instance). In this case, you can again adjust your production ratios to meet the emerging needs of your outbound logistics, driving towards further supply chain optimization. In the paragraph above, we gave some indication of how Logistics 4.0 systems might provide value for automakers in Industry 4.0 environments, but let’s get a little further down into the nitty gritty. What specific benefits does this new model of digital logistics provide? Self-monitoring supply chains: Instead of monitoring all supply chain activities through laborious manual processes, supply chain managers can integrate data from sensors and other information streams into a digital overview of the complex flow of goods and materials into and out of the factory. In this way, your supply chain can begin to monitor itself, automatically sending out alerts when a disruption or slowdown becomes likely. Network optimization: In much the same way that a fully-integrated Industry 4.0 system can help you create the optimal layout for your factory floor, Logistics 4.0 can do the same for your transport network. You can simulate the effects of any potential changes to the elements in your network—from warehouses and hubs to individual trucks and pallets—and determine through analytics workflows which adjustments would add the most value for your logistics flows. Demand capacity planning: once your production flows are digitized and integrated into a data-driven planning environment, the next step is to create synergy between those production plans and your larger supply chain operations. This is where Logistics 4.0 comes in. As you monitor the inbound and outbound flow of goods to and from your factory, you can gain a sense of your total logistics capacity (as opposed to your production capacity) and try to match it as closely as possible to demand levels in your market. This promotes a more efficient use of resources and thus improved margins. This is just a brief overview of the ways that Logistics 4.0 might impact the automotive industry. As modern, digital logistics continues to grow and evolve, it’s likely that new sources of value will emerge that we haven’t even considered yet. At this point you might be thinking: if Logistics 4.0 is so great, why hasn’t everyone adopted it? The short answer is that just as not every factory is ready for the fourth industrial revolution, not every supply chain is ready for smart, digital logistics. What defines Logistics 4.0-readiness? Well, to begin with, your organization needs to have an open, highly-digitized IT infrastructure that can integrate with those of your partners up and downstream in the value chain. Within your own organization, accessing any given piece of production data should be relatively easy for anyone with the right permissions, and visualizing your factory floor operations in order to make decisions should be par for the course. When you think about it, Logistics 4.0 in the auto industry is really going to be about expanding the boundaries of the digital factory to include things like inbound and outbound logistics. In this way, it makes intuitive sense to suggest that your success in digitizing your factory will direct correspond to your ability to digitize and optimize your logistics flows. Given the benefits that we outlined above, there’s no reason to think that an increased baseline level of digitization would be anything but a smart investment.